Chicken Wings 4 “Gold Rush” from the forth compilation book with 240 strips adapted to look great on your iPhone, iPhone Retina, iPad or iPod Touch. 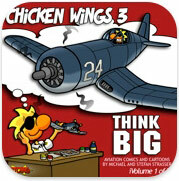 New and revamped version of our third book, “Chicken Wings 3 – Think Big”, featuring over 240 strips in crisp retina quality. Adapted to look great on your iPhone, iPhone Retina, iPad or iPod Touch. 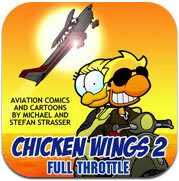 Chicken Wings Full Throttle iVol from the second compilation book with over 140 strips adapted to look great on your iPhone or iPod Touch. 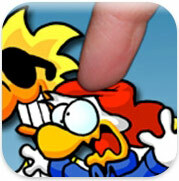 Get addicted by this fun, casual game you loved to play at the amusement park – now on your iPhone. The Roost Air Crew needs some motivation so you have to wake them up for some action by a good slap on their heads. Whack the chickens to earn money and time, but be careful not to hit Sally, she is the queen of coffee. The game ends, if you run out of time or coffee. Chicken Wings Sampler – FREE! 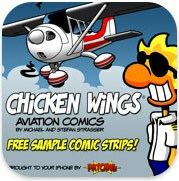 The Chicken Wings Sampler contains 30 Chicken Wings comic strips all in beautiful colors. And the best thing – it’s FREE! Share and laugh with your friends! And maybe we can tickle your fance enough to buy some of our full apps. All our original iPhone apps have been developed by PATOING mobile media. 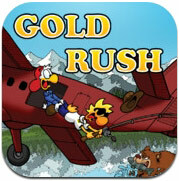 Coming soon: Links to other games and apps that we like and/or are aviation related.